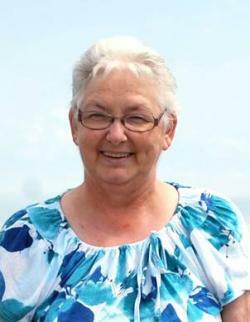 Joanne Demont, also known as "Dee", of Allison, passed away at the Moncton Hospital on Saturday, March 16, 2019 surrounded by her family. Born in Dobson Corner she was the daughter of the late Willard and Dorothy (Horsman) Corey and beloved spouse of Karl Demont. A retired homemaker, Joanne enjoyed knitting. She would cook and bake, and feed anyone who stopped in, even if they weren't hungry. She loved spending time at Jonathan's Country Music City. In addition to her husband, Joanne is survived and sadly missed by her daughter, Kimberly (Kenneth Haggart) Demont; son, Edward (Rachael) Demont; eight grandchildren, Kaitlyn, Ashley and Zachary Demont, Emily and Jasmine Hooper, Edwin, Bethany, and Hanna Mosher; six sisters, Helen (Alfred) Gallant, Hazel Corey (Joe), Flossie Corey, Donna (Carroll) Black, Bonnie Corey (Brian) and Sandra (Mike) Mitchell; two brothers, Harold (Kathy) Corey, Vincent (Juillietta) Corey; many nieces and nephews. Besides her parents, Joanne was predeceased by one sister, Linda Ogilvie; two brothers-in-law, Lloyd Demont and James, and one sister-in-law, Marie Titus. The family wishes to thank The Moncton Palliative Care Unit, Dr. Jody Enright and Dr. Elizabeth McCaw for the excellent care Joanne received. Family and friends are invited to a Celebration of Life at Salisbury Funeral Home, 3350, Rte 106 (372-4800) on Thursday, March 28, 2019 at 11 am with Rev. David Morehouse officiating. Visitation will follow. Memorials to the Canadian Cancer Society or Friends of the Moncton Hospital Palliative Care unit would be appreciated.